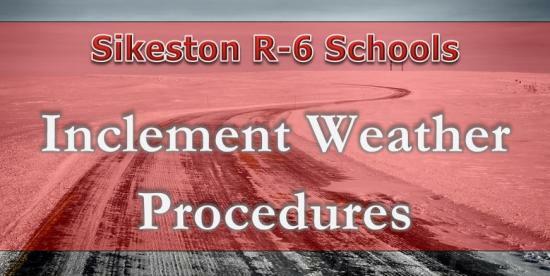 Inclement weather is always a possibility during the school year, and Sikeston R6 Schools wants to make sure everyone is aware of our Inclement Weather Procedures. While the SIS Call is being made, the cancellation notice will be placed on the district website at www.sikestonr6.org first, then Facebook, and lastly Twitter. Of course, the public may also look to KFVS12 for cancellations and delays, as well. Please know that the safety and well being of our students and staff is at the forefront of our concerns, while also ensuring that our students have every opportunity to attend school and learn.